The paper describes a new method for “blind” smoothing of nonlinear distortion in communication channels represented by Volterra’s filters. 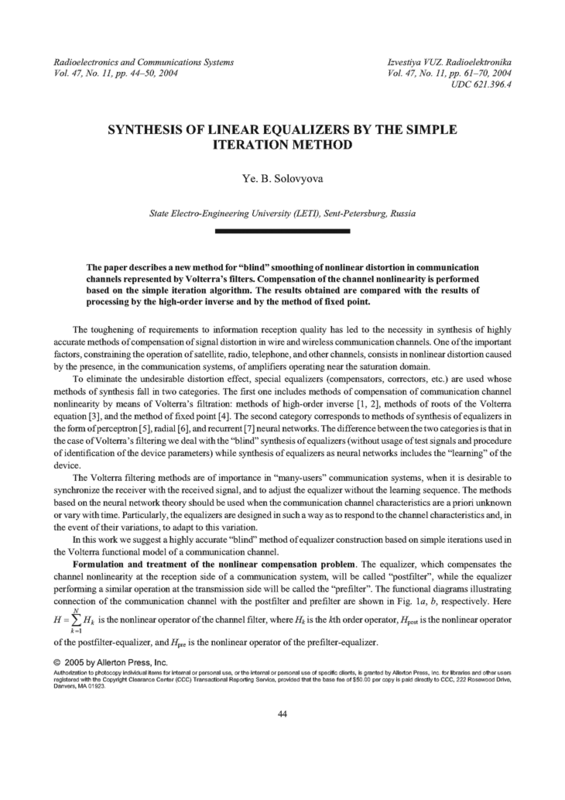 Compensation of the channel nonlinearity is performed based on the simple iteration algorithm. The results obtained are compared with the results of processing by the high-order inverse and by the method of fixed point. FANG, Y.-W.; JIAO, L.-C.; ZHANG, X.-D.; PAN, J. "On the convergence of Volterra filter equalizers using a pth-order inverse approach," IEEE Trans. Signal Process., v.49, n.8, p.1734-1744, 2001. DOI: https://doi.org/10.1109/78.934144. SCHETZEN, M. "Theory of pth-order inverses of nonlinear systems," IEEE Trans. Circuits Syst., v.23, n.5, p.285-291, 1976. DOI: https://doi.org/10.1109/TCS.1976.1084219. REDFERN, A.J. ; ZHOU, G.T. "A root method for Volterra system equalization," IEEE Signal Process. Lett., v.5, n.11, p.285-288, 1998. DOI: https://doi.org/10.1109/97.728468. NOWAK, R.D. ; VAN VEEN, B.D. "Volterra filter equalization: a fixed point approach," IEEE Trans. Signal Process., v.45, n.2, p.377-388, 1997. DOI: https://doi.org/10.1109/78.554302. MARTENS, J.-P.; WEYMAERE, N. "An equalized error backpropagation algorithm for the on-line training of multilayer perceptrons," IEEE Trans. Neural Networks, v.13, n.3, p.532-541, 2002. DOI: https://doi.org/10.1109/TNN.2002.1000122. JIANPING, D.; SUNDARARAJAN, N.; SARATCHANDRAN, P. "Communication channel equalization using complex-valued minimal radial basis function neural networks," IEEE Trans. Neural Networks, v.13, n.3, p.687-696, 2002. DOI: https://doi.org/10.1109/TNN.2002.1000133. PARK, D.-C.; JEONG, T.-K. Jung. "Complex-bilinear recurrent neural network for equalization of a digital satellite channel," IEEE Trans. Neural Networks, v.13, n.3, p.711-725, 2002. DOI: https://doi.org/10.1109/TNN.2002.1000135. BAKHVALOV, N.S. ; ZHIDKOV, N.P. ; KOBEL’KOV, G.M. Numerical Methods [in Russian]. Moscow: Nauka, 1987. LEBEDEV, V.I. Functional Analysis and Computational Mathematics [in Russian]. Moscow: Fizmatlit, 2000. PROAKIS, J.G. Digital Communications, 4th ed. McGraw-Hill, 2001.